How can I get kinetic information from an ITC experiment? The elucidation of kinetic aspects of molecular interactions has been gaining interest in many research areas. For instance, the quantitative analysis of binding kinetics helps to a better understanding of the biological function of molecular interactions; it also serves to identify and characterize lead compounds in drugs discovery programs. Getting kinetic information of a binding event requires the use of real-time techniques in which, an observable is monitored as a function of time during the course of the titration. Isothermal Titration Calorimetry (ITC) has been formally considered a technique to get steady-state binding information. However the primary data of an ITC experiment (ITC raw data), the power vs plot time, is the result of monitoring the heat flow as a function of time. Therefore, the power vs plot time could deliver kinetic information as well. 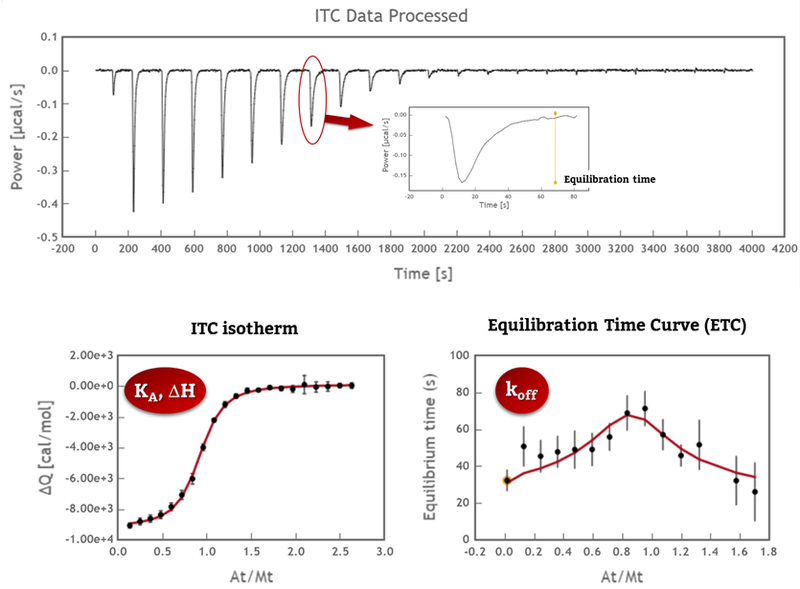 KinITC (1) is a new analytical tool implemented in AFFINImeter and developed to obtain kinetic information from ITC data of 1:1 interactions. The method consists in determining the Equilibration Time for every peak of the power vs time plot (that is, the time needed to return to baseline after injection) and plot it against the titrant to titrate molar ratio to obtain the so called Equilibration Time Curve (ETC). Noteworthy, a clear sign that the ITC raw data plot contains kinetic information is the increase of the Equilibration Time of the peaks close to mid-titration. Under these conditions, fitting of the ETC yields the dissociation rate constant, koff. Fitting of the corresponding isotherm yields the association constant, KA; ultimately, the association rate constant, kon, is calculated as the product of koff * KA. Dr Muñoz has worked as a researcher for over 15 years in different international centers in Spain, Germany and the USA, focusing on the characterization of complex biomolecular interactions by different experimental techniques such as NMR, FT-IR, fluorescence and Surface Plasmon Resonance (SPR). She has a high publication record in this area as well as two patents on biotechnological developments. Eva is working with us in the validation and design of AFFINImeter as well as in the implementation of functionalities for the analysis of SPR measurements. Spooktacular offer👻🎃 AFFINImeter Spectroscopy 3 months free! KinITC: Transforming the ITC roles in Drug Discovery.